I identify as a special education teacher and a critical (dis)ability studies scholar. This means, more often than not, I find myself having conversations with pre- and in-service special educators helping them to unlearn what it means to be in special education. This is a necessary step before I can move on to the things students have registered for my class to do, such as create clear individualized education programs (IEPs), engaging lesson plans, or effective behavior intervention plans. The conversation around special education tends to rely on a medical model of (dis)ability; that is, the “problem” is defined as the person with the (dis)ability, who is seen as the reason why teachers need to change their teaching methods and approach. In contrast, (dis)ability studies asserts that, in fact, the “problem” is not the person or the (dis)ability, but how we as a culture view them. Critical (dis)ability studies (DisCrit) is the integration of (dis)ability studies and critical race theory, highlighting the social construction of both. DisCrit emphasizes the social, political, and economic structures and sites (such as school) that either support or unravel the notion that the individual is to blame for an uncomfortable fit with the environment. Here are some common topics that highlight the divide between the medical and social models of (dis)ability: classroom management; how to deal with students who have an emotional/behavioral disorder; and how to manage students in a special education classroom whose native language isn’t English and who may or may not have an IEP. These issues, which arise early on in many of the methods courses I have taught over the years, have more in common than my students realize—primarily, that the process of labeling a student is (dis)abling. Who then gets to define what is “inappropriate,” “satisfactory,” or “normal?” What we know to be true is that more children of color are being diagnosed with an emotional/behavioral disorder than their white peers. We are also seeing a rise in emergent bilinguals (also known as English language learners) in special education classrooms, for reasons unrelated to their ability to learn, but rather their teachers’ inability to engage them. What this means to me, as an educator of special educators, is I must first engage my students to think about their own biases before I teach them how to write a proper “present level of performance” on an IEP. By introducing DisCrit into a classroom discussion about a subjective label such as an emotional disorder, I encourage my students to think about, write about, and talk about incredibly uncomfortable issues such as racism, classism, ableism, and heterosexism that must be addressed and unpacked before they step into a classroom and continue the cycle of labeling/ “othering” students. For example, rather than qualifying as having an emotional disorder, a child might instead might need five additional minutes in her first period class to transition out of the role of adult—since at home she acts as the primary provider to her siblings while her single-parent/guardian works the night shift—and into the role of kid. When we assume our students should adopt the role of “kid” without first knowing who they are outside of school, we will likely be met with frustration, a lack of trust, and/or anger. I encourage my students to be mindful of the possibilities before jumping to a behavior intervention plan. When students talk about issues in classroom management, I encourage them to spend time making the content they’re teaching culturally relevant; sometimes when they do so, classroom management issues dissipate. I invite my pre- and in-service teachers to think critically about how we can workshop their lesson plans to be inclusive in language and representation—can students see themselves and hear themselves in the content being taught? If classroom management is still an issue after that, then we can discuss further strategies. It is my hope that student educators are willing to be self-reflexive both inside and outside their classrooms. Being a (special) educator requires much more than a skillset to write an IEP or design a functional behavioral assessment. What cannot necessarily be evaluated by a credentialing exam are the most desirable qualities in an educator: are you willing to look at yourself, your expectations of others, your assumptions about other people? And, even more importantly: Are you willing to change? For those who want to explore these issues further, below are some links to general statistics of California students in special education classrooms, informative (dis)ability studies websites, and a “voices from the (dis)ability community” video. 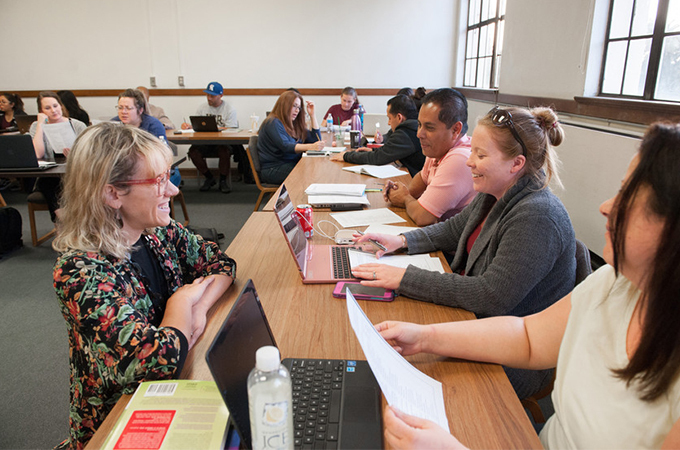 More information is also available on programs at the University of Redlands School of Education.